Genomic Selection is a computational tool that allows breeders to calculate the genetic potential for any trait of interest. The only requirement is that there is enough DNA profiles (genotypes) that can be assocaited with corresponding trait dataq (phenotypes). DLF is engaged in a number of projects that focuses on new traits, which may be of major importance in teh future. 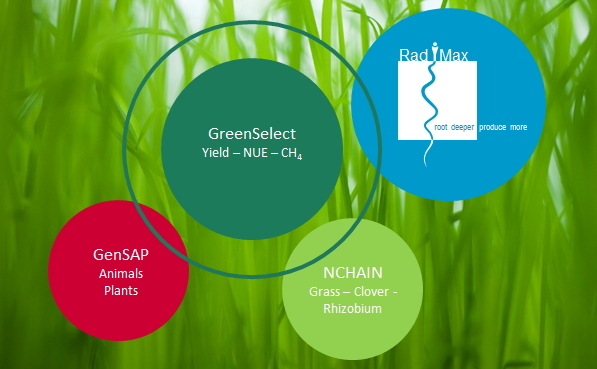 In NCHAIN we look at the ability to make the highest protein field output, when you grow grasses together with clover. In GenSAP we look at the different computation methods in order to find those that yield the best genomic predictions of breeding values. These projects are in many ways linked together and bound by one common denominator: Genomic Selection.